Spectro UV-Vis Double PC 8 Auto and 1 Fixed Cell (Model UVD-3000) is a high performance UV-Vis double beam automatic scanning spectrophotometer. It is an automatic eight (8) cell spectrophotometer for precise testing with a fixed bandwidth of 2.0 nm. Model UVD-3000 spectrophotometer offers high performance, ease of use and reliability, which can be used in various applications. 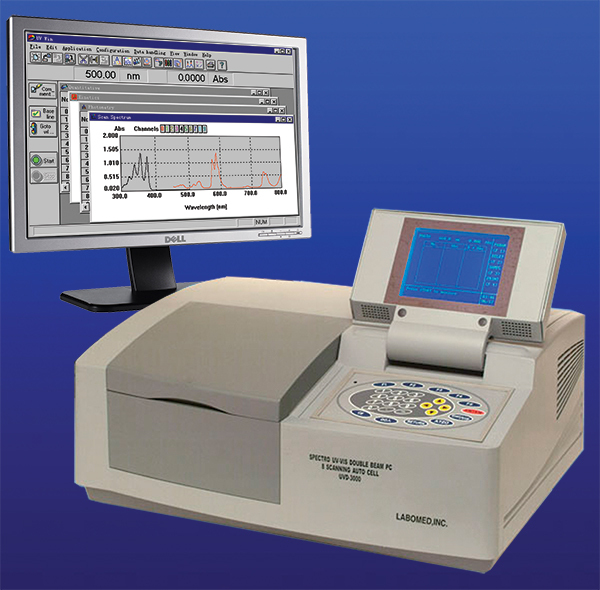 Spectrophotometer Model UVD-3000 can be used extensively for qualitative and quantitative analysis in such fields as pharmaceutical inspection, clinical analysis, petrochemistry laboratories, chemistry and biochemistry laboratories, DNA/RNA analysis as well as in quality control departments, i.e. environmental control, water management, food processing, and agriculture. Spectro UV-Vis Double PC 8 Auto Cell (Model UVD-3000) utilizes a new optical system design and is microcomputer controlled. With its focused-beam design, the system provides optimal and reproducible results for small samples. The sample beam and the reference beam are provided within the same sampling space, facilitating wider and longer scan of data providing a more detailed view of the results in an easy to use environment. This instrument has excellent baseline stability and high resolution and permits scanning, quantitative analysis, kinetic spectrophotometric analysis, protein, nucleic acid, DNA/RNA analysis, micro and macro measurements through PC control. This product is capable of processing data, from analytical and spectrum testing. Spectro UV-Vis Double PC 8 Auto Cell (Model UVD-3000) has a large LCD screen which displays the menu screen and of course makes the device easier to use. Additionally, this instrument permits the apparatus to be linked to a computer and a printer to display the photometric and spectral data on the PC monitor, using the new UVWin 6.0 UV-VIS application software, presents to the fullest of the fascination of modern computer technology. This Spectro can be used only linked to a PC and comes with a USB interface to connect to the computer. is a high-performance, reliable, and exceptional value instrument which is the hallmark of Labomed UV-Vis spectrophotometers. 1) Model UVD-3000 Spectro UV-VIS Double PC 8 Auto Cell with fixed bandwidth of 2 nm. Full use of Computer Technology:Being computer controlled with compatible with Windows XP, & and 8, using the new UVWin 6.0 UV-VIS application software, presents to the fullest of the fascination of modern computer technology. Now all Labomed, Inc. split and double beam spectrophotometers with our newly developed software called UV-Win 6.0 can be used with Windows XP, Windows 7 and Windows 8. It is capable of testing more applications with its RS-232 and USB connections, and supports the data export of measured results to the PC and then flash drive, when additional data storage is required. One of the new features is that it provides 3-D graphing of the spectral results. Photometric Measurement: Measuring transmittance or absorbance at the current wavelength together with K factor calculations. Printing of measured data by using any Printer with Parallel Port connection available. 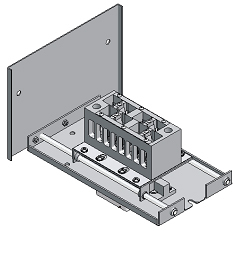 - Sample Chamber: Automatic eight-cell sample holder.